The French Research Institute for Exploitation of the Sea IFREMER, one of our oldest partners since 1986 and Isatis users since its very beginning has called Geovariances’ expertise to create a bathymetric model covering the entire French Atlantic coast with a resolution of 100m x 100m. 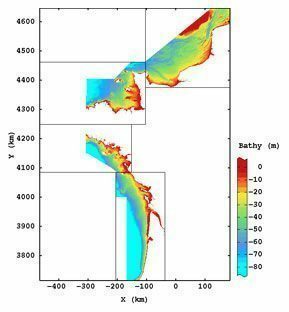 This project, also in collaboration with the SHOM (French Service Hydrographique et Oéanographique de la Marine), aims at giving a cartography of the bathymetry associated with the uncertainty and information about the origin (kind of data, age) of the data used for the interpolation. This area contains more than 30 million points of bathymetric soundings taken from existing database. The largest part of this data set is coming from the BDBS database (Database of Bathymetric Data from the SHOM) and is completed by additional information (MNT grids, data from independent ports, digitization of paper sounds). The large amount of data required an important work of data quality control and selection (identification of priority data and redundancies). The methodological analysis has enabled the study of the most appropriate interpolation method and its application to the entire French Atlantic coast via an automatic procedure ranging from data import to the export of the final numerical results.